A few years ago I made a post called THE MONA FREEMAN COLLECTION. If you click on the highlighted link you will find two spanking photos from the movie DEAR BRAT, and then a further three photos from the movie DEAR RUTH, two setup photos and one spanking one. From the comments on that post it would appear that a spanking scene was filmed for Dear Ruth, but the scene did not make the final movie cut. Now I have come across a good number of performances for Dear Ruth in plays, but until recently I had not found one that contained a spanking scene, leading me to believe that there is not one written into the play. Perhaps in Istrouma, LA in 1954 there was a traditionalist who had the original source material and kept the spanking scene in there. This isn’t something that I know for sure, I am purely speculating based on the comments that were left for Dear Ruth that there was originally a spanking scene in the movie script. Perhaps some fellow observers of historic movie spankings can add to this post. Anyway, here is the photo from the 1954 play. 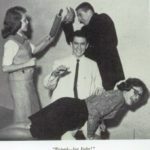 What I like about the image, other than the obvious spankable target, is that the other hand of the guy doing the spanking has a hold of the wrist of the girl being spanked. A bit of an unconventional method, but it seems to do the trick. The only question I have is that I don’t know which hand belongs to the spanker and which hand belongs to the person behind. The person behind is either making a STOP sign and the spankers hand is in motion and is flat, or the person behind has a hold of the spankers wrist. It looks like the former, but common sense says it is the latter. P.S. I also found a different copy of this image in a folder sent to me by Will@gotham56 so I will give him a shout out as well. I really enjoyed this find. The positioning and expressions do make it one of my favorites. Although i do have to admit that with the witness in back it does remind me of another stage spanking. Thanks for sharing and have a great day. I agree, Jim, I had to do a double check and then a triple check to make sure that I had identified the correct image. True enough though, while it looks like a Men Are Like Streetcars pic, it is indeed Dear Ruth. I’ve now read Norman Krasna’s script for Dear Ruth. Miriam is threatened with a spanking in the first act and near the end of the play she admits that she deserves to be punished, and indeed says she is devising an additional punishment for herself over and above whatever her father does to her. And then – nothing! 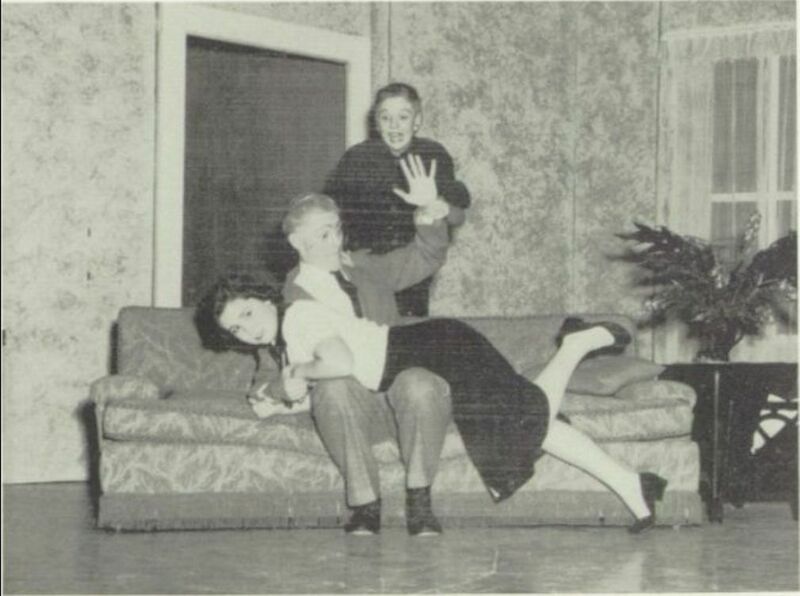 So the school in 1954 must have decided there was something missing and added the spanking. Thank you for that information, Harry. Based on your knowledge, it would seem that it is a play worth our attention to keep searching in the future.